Under the sea, transform faults connect offset mid-ocean "spreading centers," places at seafloor ridges where new oceanic crust is formed through volcanic activity and gradually moves away from the ridge. "Slow slip directly triggers seismic slip—we can see that," said co-corresponding author Vaclav Kuna, a graduate student in geology and geophysics in OSU's College of Earth, Ocean and Atmospheric Sciences. "The findings are very interesting and may have some broader implications for understanding how these kinds of faults and maybe other kinds of faults work." The seismometer deployment—from September 2012 to October 2013—resulted in the detection of more than 1,600 earthquakes at the Blanco Ridge, a 130-kilometer segment of the Blanco fault that served as the study area. Two distinct asperities—basically rough edges—along the ridge rupture roughly every 14 years with quakes in the magnitude 6 range. At its southernmost point, the Blanco Transform Fault is about 100 miles from Cape Blanco, Oregon's westernmost location, and the fault runs northwest to a point about 300 miles from Newport. Kuna explains that the layers have different levels of seismic "coupling," the ability of a fault to lock at asperities and accumulate stress. 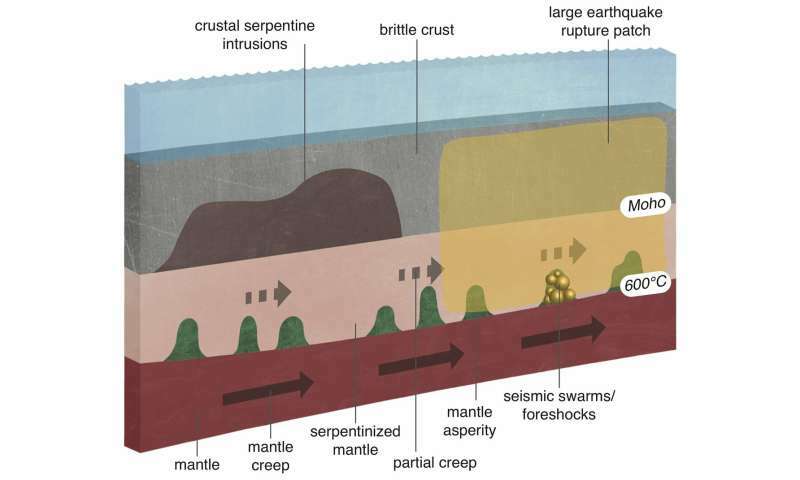 "The crust is fully coupled—all slip is released in a seismic way," Kuna said. "Fault in the shallow mantle is partly coupled, partly not, and releases slip both seismically and aseismically. The deep mantle is fully creeping, uncoupled, with no earthquakes. But the fault is loaded by this creep from beneath—it's all driven from beneath. Our results also show that an aseismic fault slip may trigger earthquakes directly, which may have implications for active faults on land."